In proof-of-work networks, hash is everything. Because of this, Coinmine is desirous of complete decentralization in line with blockchain dicta. As such, the startup with backing from CoinBase and Arrington Ventures is taking crypto mining to homes as their flagship rig—Coinmine One is power efficient—at 120 watts, easy to use—it has its own operating system and use GPU chipsets (AMD RX 570 (4GB)). With widespread use, the miner will ensure complete decentralization within the networks deployed in. The only disadvantage with Coinmine One is that it won’t be powerful enough to mine Bitcoin and Litecoin. Furthermore, the rig is pretty expensive. Regardless, because it can mine ETH, Monero, ZCash and Ethereum Classic, the miner shall come in handy in stabilizing the crypto scene that has so far experience hash rate declines as bears step up. Meanwhile, Kucoin, an exchange from where traders can buy or sell Litecoin has completed a $20 million Series A funding. Led by LDG Capital, Matrix Partner, and Neo Global Capital, these funds will go towards activating Kucoin platform 2.0, improving customer care, accelerating research and education and most importantly for global expansion. This way, more people will have a better understanding of blockchain and similar products. If appealing enough then they can invest further increasing liquidity and stabilizing prices as a result. 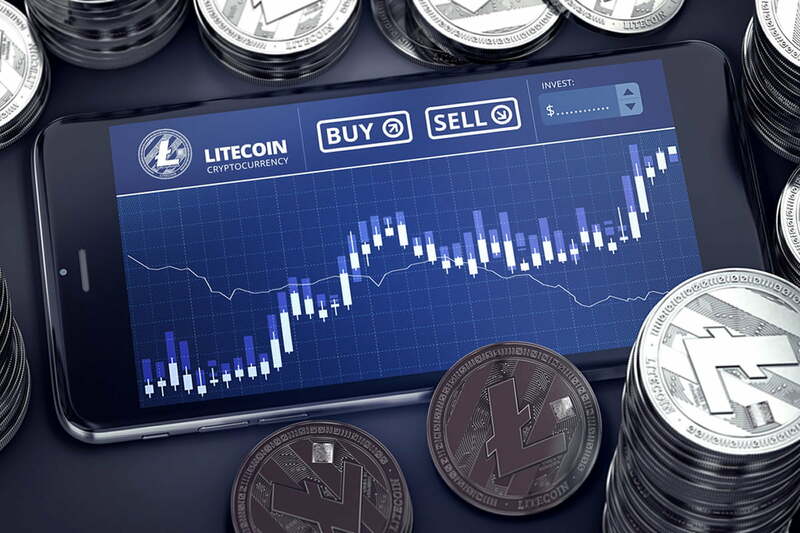 The capitulation of Bitcoin prices is negatively affecting Litecoin and the result is visible. After weeks of horizontal consolidation, LTC/USD is now down 18 percent in the last week but pretty stable in lower time frames. 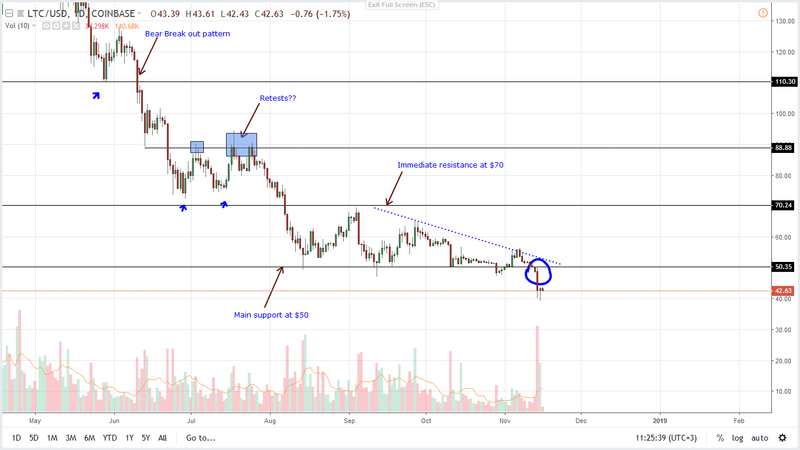 As a result, Litecoin is down more than 85 percent from 2017 peaks in the process confirming the bear break out pattern set rolling by early August losses. Note that LTC/USD is now trading below the $50 main support and sell trigger line and fueling this massive sell off are huge volumes—almost twice the weekly average at 1 million from 600k. From previous emphasis, conservative traders can short at spot with stops at $50 with first targets at $20-$30. Losses beyond that and Litecoin can easily print $2—a level last tested in March 2017. Clearly, LTC/USD is bearish and in line with our previous LTC/USD trade plan, we recommend both set of traders to short at spot prices. This way they shall be trading in the trend direction set by Aug 7-8. This is largely because of the failure of bulls to maintain prices above $50. Then again, with a whole bear candlestick printing below $50 triggering stops and igniting sells effectively cancelling our bullish projection at the back of strong market participation, LTC would most likely test $30 or lower in coming days/weeks.